Disclosure: This post contains affiliate links. Please see our full disclosure for more info. As I type this, bread and water are flying off the shelves at every grocery store on the eastern half of North Carolina and beyond. We’re in full-blown hurricane preparation mode here, and there’s lots to do. Preparing for a hurricane can be stressful, especially when you’re a mom with little kids counting on you to keep them safe, dry, and fed. Try not to let that fear and stress paralyze you from making hurricane preparations. So let’s dive right in, make a plan, and get to work, shall we? Will you stay put or evacuate? If you evacuate, where will you go? Now’s the time to think about where you’ll go, what routes will be the least crowded, what destination is likely to have power, and how far in advance you’ll need to leave. Don’t wait until the last minute to research hotels and book a room. You’ll be less likely to find a place with vacancy if you put this off. You could also call a friend or relative if you need somewhere else to stay. Pro tip: Make sure you jot down any important phone numbers in case your cell phone runs out of battery. Talk with your family/spouse about where you’ll meet if you get separated during the storm. Whether you evacuate or not, you’ll need to stock up on essential supplies. Grocery stores will run out fast, so try to stock up as early as you can. If you have an infant, be sure to stock up on any pumping supplies or breastfeeding supplies you’ll need. If formula feeding, make sure you have enough on hand. Pro tip: If you’re an exclusively pumping mom, be sure to get a manual hand pump in case you lose power. We use these battery-operated candles in our home when we have power outages. This way we don’t have to worry about the kids getting burned or an accidental fire. They give off plenty of light, especially if you put a small group of them together. Once you’ve stocked up on supplies, now it’s time to get them organized. You don’t want to be running around in the dark, tripping over legos and fumbling around for the flashlight. You’ll also want to be sure the outside of your home is ready. Tie down or bring in all outdoor furniture and toys. Board up windows as needed. Take down the swings and put them in the garage. Place sandbag in front of the garage door to prevent water from leaking in. Purchase fuel for your vehicles and/or any generator, grill, or propane stove you have. Clean up and organize clutter. Catch up on all dirty laundry. Make sure all dishes are washed and put away. Sanitize baby bottles, pacifiers, and other baby essentials. Pack an overnight bag in case of emergency evacuation. Click here for a packing list! Take photos of your home and valuables in case anything is damaged and you need to file an insurance claim. Grab your flashlights, spare batteries, candles, battery-powered radio, first aid kit, manual can opener, and any other essential supplies and keep together for easy access. Charge up phones and tablets. Make sure your portable charger battery is full, too. Gather important documents (birth certificates, health insurance cards, etc.) and place them in waterproof Ziploc bags. Okay, maybe this step should have gone first, haha! 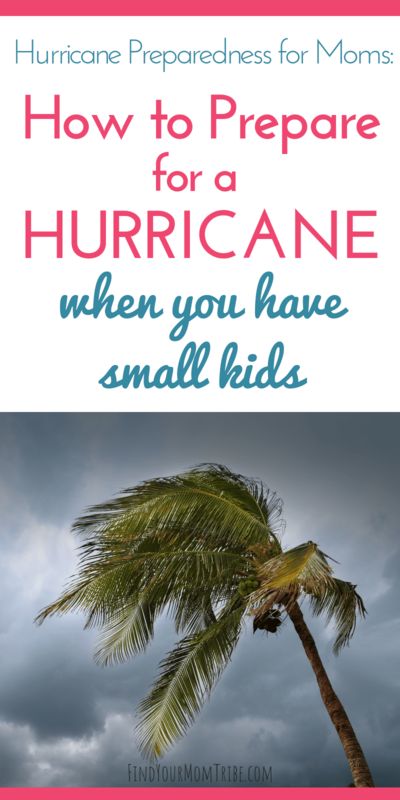 Kids can be really afraid if they’ve never experienced a hurricane before. If you’re nervous or stressed, they will sense it and feed off of your anxiety. Try to be a calm, steady presence for them and remind your kids that they can talk with you if they are worried. Preparing them for what to expect will help them to be less anxious. Talk about what will happen during a power outage so that they’ll be mentally prepared if the power goes out. If watching the weather increases their anxiety, it’s probably best to turn it off and watch when they’re not around. If you’re a praying family, you can have a special time of prayer for protection. Another good thing to do is to plan some activities for your kids. 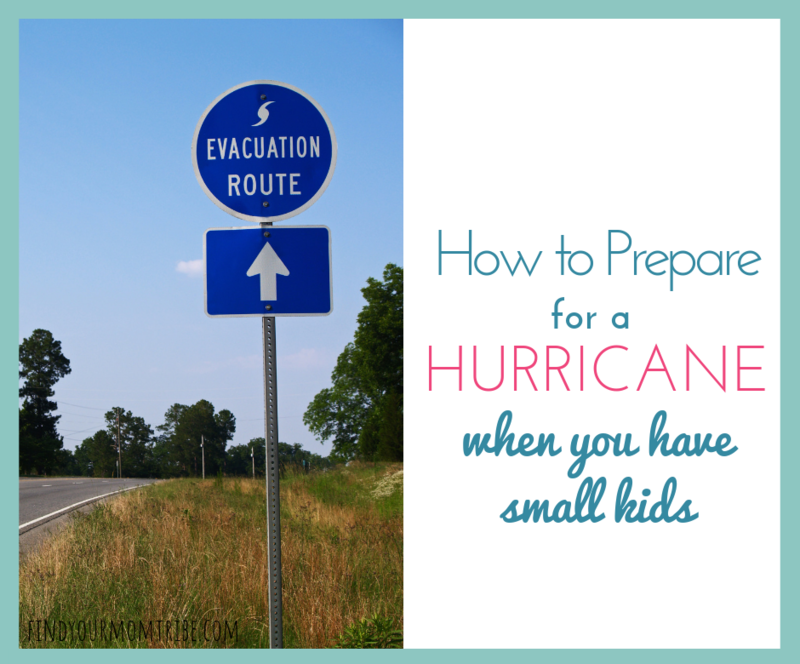 They’ll be bored to tears without power, so having a few things ready for them will save your sanity. We like to have sing-a-longs and play board games during power outages. Simple crafts, coloring books, and storybooks are also great to occupy littles. Okay, friends…deep breath. If you’re in the path of a hurricane, please comment below so we can pray for each other. Take care and stay safe! (PS- Don’t forget to save this post for later! Hi! Thanks for stopping by! I'm Marianna - a homeschool mom by day and a mental health counselor by night. I'm passionate about supporting and encouraging other moms. Click the first circle below to learn more! Copyright © 2019 Find Your Mom Tribe. All rights reserved.